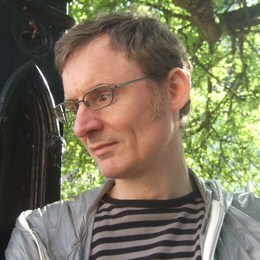 John Shelley studied children’s book illustration at Manchester and debuted in London before skedaddling off to Tokyo for very many years, seeking the connection between Ukiyo-e and Ultraman. Establishing a studio in Tokyo, he worked on illustration for a wide variety of clients from advertising to editorial, whilst producing children’s books for publishers across the globe. John divides his time between Japan and the UK, with agent representation in the US. 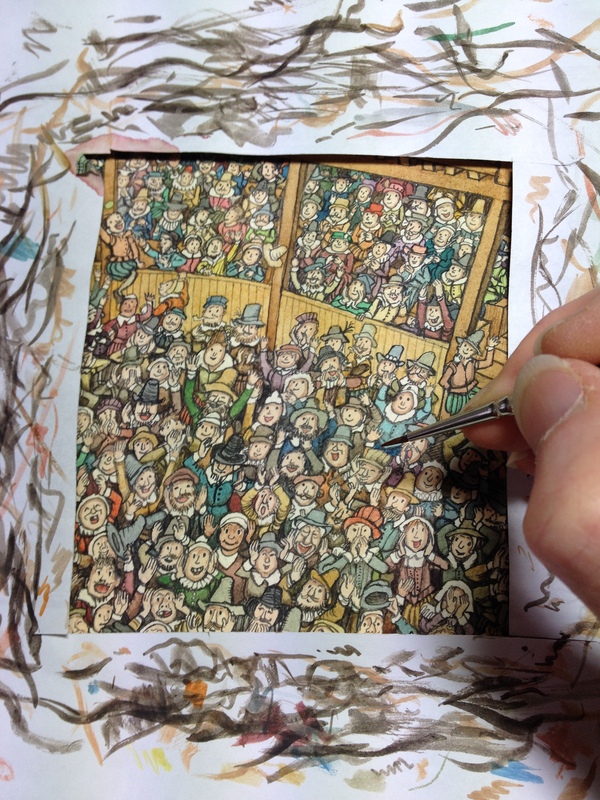 Most of his work is based on pen and ink drawing, coloured traditionally in watercolour, or adapted digitally. The whole book is first plotted on a storyboard, with small thumbnail idea sketches to get a basic idea of the approach, also decide how the book flows, patterns, tone etc. This is the storyboard from Halloween Forest. On sheets of ordinary A4 (210 × 297 mm) copy paper I draw more developed pencil roughs, one A4 sheet per spread (so A5 148 x 210mm) for a single page. As these are still much smaller than final artwork size it’s still very flexible, pencils can be rubbed out, redrawn or adjusted quite easily. This is a pencil rough for Crinkle, Crackle, Crack – It’s Spring! Dummy page from Crinkle, Crackle, Crack – It’s Spring! The rough sketches are scanned and assembled into a picture book layout at the correct size and proportions of the finished book (in the past I used InDesign for this but have recently switched to Clip Studio). I use a computer to re-position, adjust, add, and edit the pencils until I’m happy with things, then the text is dropped in to make a pencil dummy and sent to my editor as a pdf for approval. There’s usually some to-and-fro between publisher and my studio, adjustments and resubmissions, before I get the go-ahead for finals. 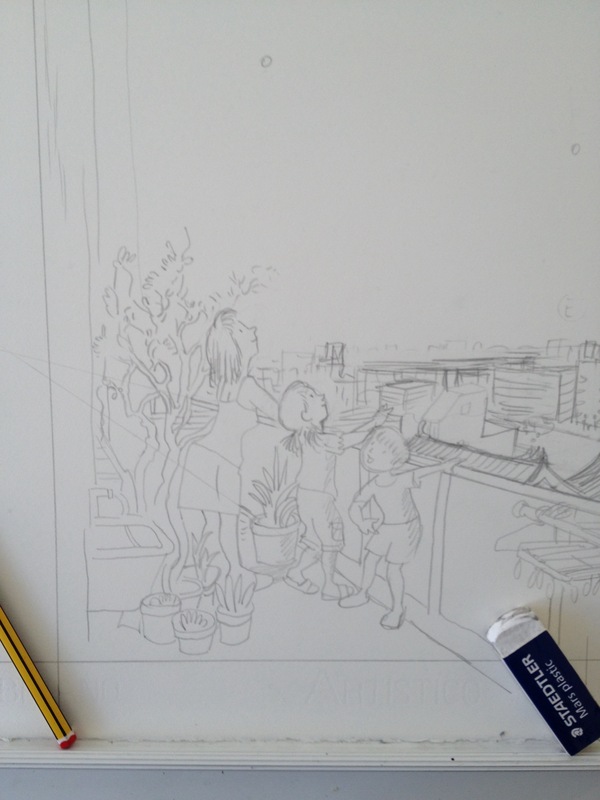 Once I get the green light from the editor or art director I print out a copy of the pencil dummy and blow the A4 spreads up to around 115% bigger than the final book size on a photocopier. Using a light box these photocopies are then traced on onto watercolour paper and any remaining underdrawing penciled in directly on the artwork paper. This tracing is for my current Japanese picture book work-in-progress Yozora o Miageyo. Using dip pen nibs and indian ink I start inking in the spreads. I often water down lines for lighter areas and some details. These are for Crinkle, Crackle, Crack – It’s Spring! 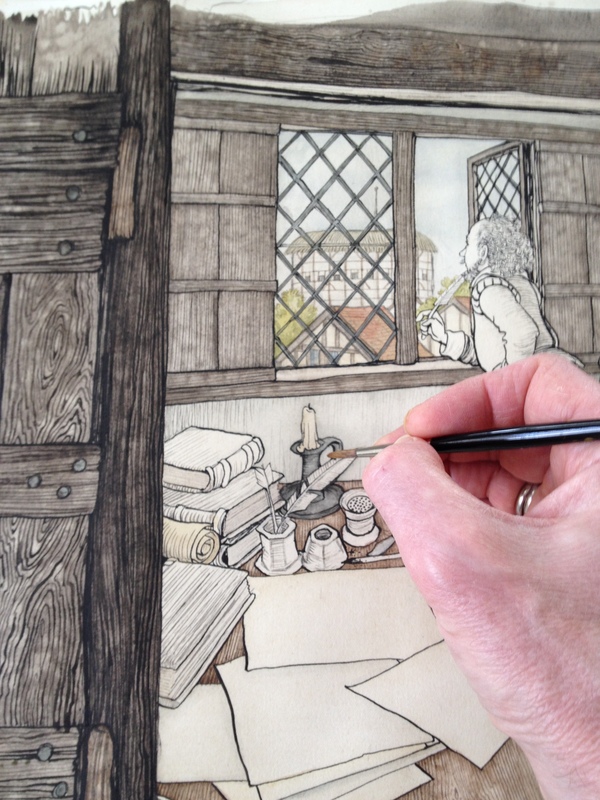 Half way through inking a spread for my forthcoming book on Shakespeare, Will’s Words. For watercolour paper I usually use Leonardt EF Principal nibs, or for purely B/W work Gillot 303. Once all the drawing is finished and ink dry, pencil is rubbed off and I make a back up scan of the artwork (just in case!). 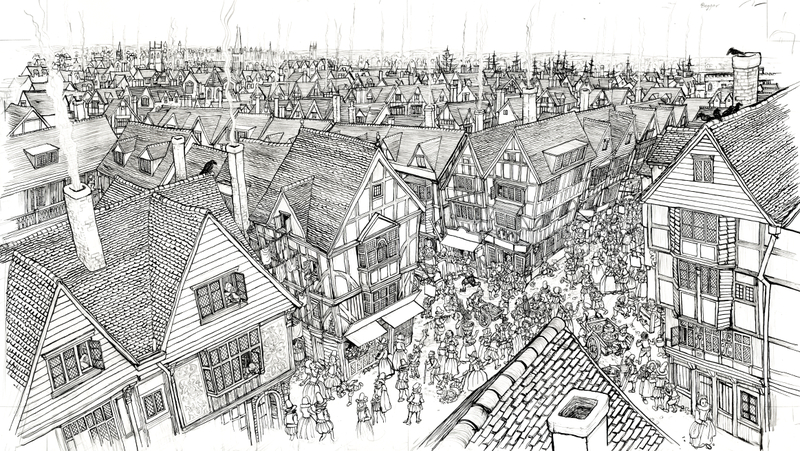 Here’s the completed drawing for Will’s Words before colouring (see below for the coloured version). 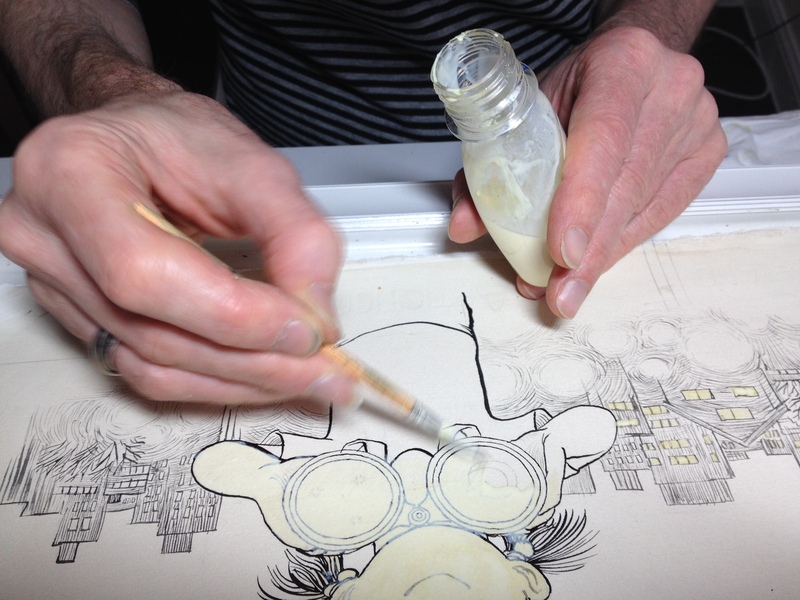 Sometimes I’ll first mask out areas using masking fluid (I believe it’s called “frisket” in the US). I then begin painting the first washes in watercolour, often starting with a thin tint over the whole surface consisting of a mix of yellow ochre and sepia, dabbing off areas to be left pale as it dries. This helps the first washes to dry cleanly, also helps to establish depth and tone as washes are slowly built up. Here I’m masking the cover character for Yozora o Miageyo so I can easily paint in a dark background. Painting progress on Will’s Words. As work gradually gets more detailed brushes get smaller. I use a variety of watercolour techniques – over-tints, wet-on-wet, back-fills, dry-brush etc., each book is different, painting always involves new experiments. Painting the Milky Way for Yozora o Miageyo. Finally some finished illustrations of some of those shown above – These two are from Crinkle, Crackle, Crack – It’s Spring! And another from the forthcoming Will’s Words, released in March 2016. 33 years now, my first illustration commission was in 1982, my how time flies! It was for black and white drawings and colour cover for the novel ‘Fatbag’ by Jeremy Strong, published by A&C Black in London. Surprisingly the book is still in print in it’s paperback edition, much to my embarrassment. Now that’s got me thinking – I think the very first thing I ever sold was a school art project which was bought at the school fund-raising fair by a visiting parent for £10, I was around 15 or so at the time. I was astounded that someone actually wanted to give me money for one of my pictures. It also proved my first lesson in business – the customer made me re-paint it because the paper was buckled and he couldn’t get it framed. 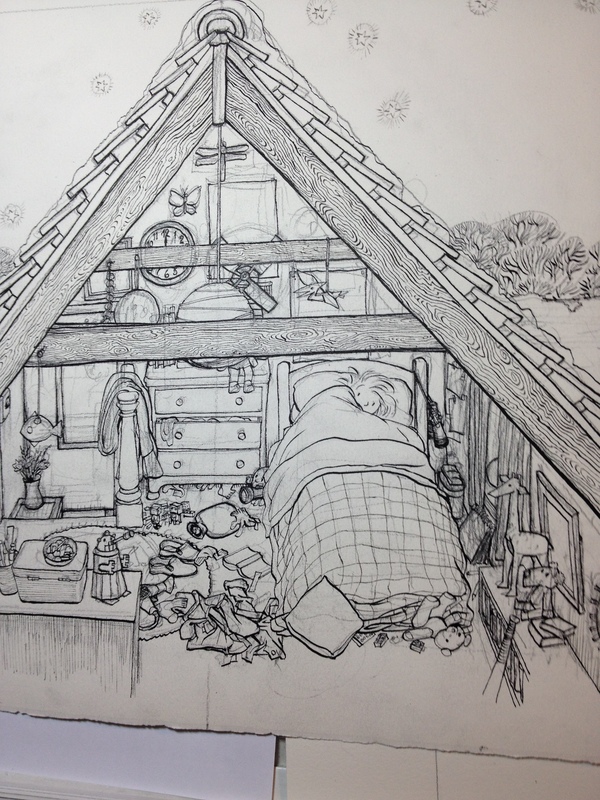 Around the same time I sold drawings of local scenes and wildlife in an art/gift shop, and for a while had a weekend business drawing pen and ink views of people’s homes on commission, at something like £5 a drawing. Humble beginnings! Did you attend college to study art? Yes, I did a 1 year foundation course at the wonderful Bournville School of Art in Birmingham, across the green from Cadbury’s chocolate factory. Then a three year degree in illustration at Manchester Polytechnic. The head of the illustration course was Tony Ross. It was almost exclusively illustration, of all genres, but with an emphasis on editorial and advertising, as in those days that was where most illustrators earned their living. There were 11 students in the group, the staff tended to include one student covering each genre of illustration every year, and in my year I was the sole children’s illustrator. This meant I perhaps had more of a connection with Tony Ross than the other students, but it wasn’t specifically a children’s illustration course. This was at a time when the music scene erupted in Manchester – punk, post-punk, Factory Records etc, so indie music also made a big impact. What happened that made you leave the UK and go to Japan? A year after graduating I moved to London, during which time my eyes opened to the art of many cultures. 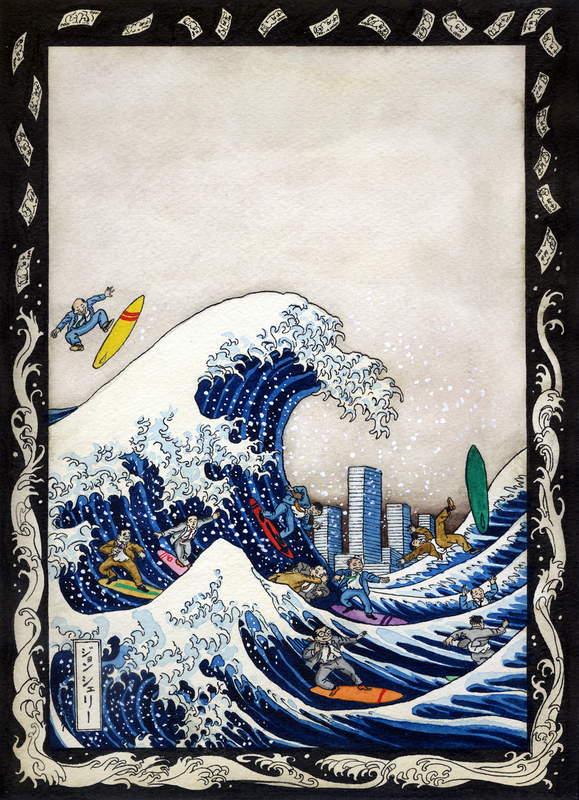 Originally I’d been inspired by the Golden Age illustrators – Rackham, Dulac, Beardsley etc, and I began to look at the things that inspired them in their time, and thus discovered Japanese woodblock prints (Ukiyo-e), which of course had an enormous influence on Art Nouveau and graphic media in Europe in the nineteenth century. I became pretty well absorbed by Japanese art in a short time, you could say I fell in love with Japan through Utamaro and Hokusai. At a Japanese Festival in Battersea Park I met the organisers, an Anglo-Japanese society run by ex-JET scheme teachers and was ‘volunteered’ to design their newsletter. After two years of absorption in the London Anglo-Japanese community I was the only volunteer who had never actually been to Japan, so decided it was time to go and see what the country was like for myself. Someone introduced me to a sponsor in Tokyo, a Japanese magazine offered me a working permit, I thought I’d be there a year, two at most – it actually became 21 years. Well I’m still learning really, it’s a process that never ends! Having studied Japanese in London I knew some basic expressions when I arrived but nothing that really prepares you for the full-on experience of Tokyo. Unfortunately things didn’t work out with the magazine sponsor when I arrived and we parted ways after a few months so I had to learn the language quickly – I spent a lot of time in the British Council library with a teach-yourself guide, I think I could express myself reasonably after a year, but fluency came later. How did you manage to sell your art, before you learned the language? Other than a few drawings made for my erstwhile sponsor, first commissions in Tokyo were for the English-language press. I initially began working with Japanese clients through personal introductions, either the person introducing me acted as interpretor, or we made do with the client’s inadequate English/ my inadequate Japanese. I had a few jobs that way, and some comical meetings! I worked hard on researching the market, knowing who was who, what was being published, what styles worked etc. After a year there was far less comedy, then I was commissioned by Parco department store to create monthly posters for two years – one of them was awarded “Best Ad of the Month” by Commercial Photo magazine, Parco opened the door for me in Japan. Do you feel living in Tokyo helped develop your style? The new circumstances of living in Japan forced me to re-evaluate my work and experiment. In London I’d not worked on advertising at all, but my very first Japanese freelance job in Tokyo was a poster for a department store. I gave the client a fairly complicated drawing in my ‘editorial’ style showing a variety of elements, the designer cropped it to a single figure – just one small detail, blew the figure up to enormous size and filled it with bright, flat colour. – it was a simple, bold image, strong design, clean colours, one of the biggest lessons of my career and it became the basis of the “poster style” I used with Parco – very different from my children’s book work. For children’s books my style and technique remained basically the same, but colours became less fussy and cleaner, less heavy detail, fewer dark shadows. Part of this was due to the brighter light of Tokyo, but also the tastes of the market – in Japan the feel and atmosphere of picture books are at least as important as narrative, especially lighting and characterization. One other consequence of Japan on my children’s style is that often there was a subtle, and sometimes not-so-subtle editorial pressure to “be European” in my approach to a work, e.g. I was commissioned for European fairy tales because I would produce something more authentically “Western” than Japanese illustrators. This tended to encourage me towards a traditional style reminiscent of my heroes of the ‘Golden Age’, which, though very satisfying, could sometimes be a little restraining. What type of work did you do before you made the move to Japan? My first three professional commissions were all books – B/W drawings for children’s novels, but thereafter working full time in a London studio meant much of the bread-and-butter bill paying work I did before Japan was editorial: magazine cuts, book jackets and so on. Nevertheless children’s books were always my main thing – the last project I completed in London before I left England was The Secret in the Matchbox, my first trade picture book. Oh, that would be when I was around 16, prior to that I knew I wanted to be an artist of some kind, but I determined on illustration for children’s books after re-discovering the work of the Golden Age illustrators, especially Arthur Rackham. My mum actually had some books illustrated by Rackham and his contemporaries preserved from her childhood, but the penny dropped with me when I came across his work for Peter Pan when I was on holiday. 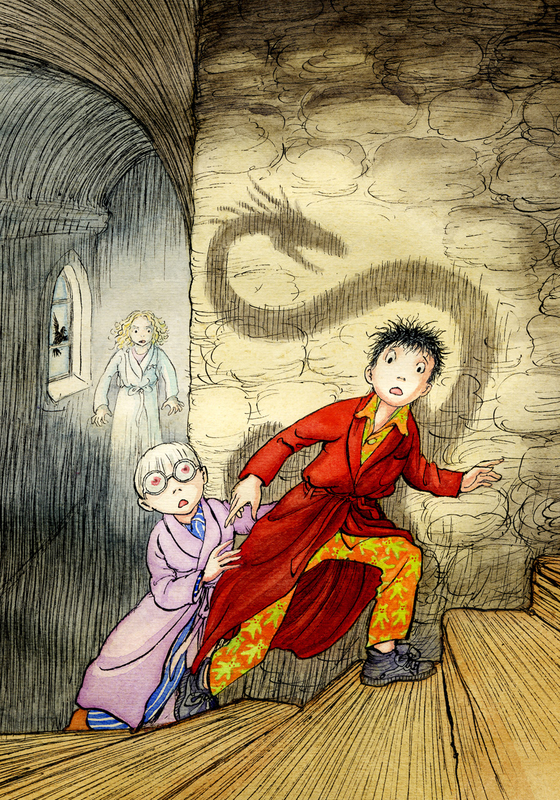 I was hooked thereafter – book illustration has fascinated me ever since. As mentioned above, it was my first ever commission, B/W line drawings and cover for the comic novel Fatbag by Jeremy Strong, first published in 1983. I followed the usual route of illustrators of the time – I bought the Writers and Illustrators Yearbook, cold-called publishers to make appointments, and jumped on a train to London to spend a day lugging a heavy portfolio around showing my work. I remember A & C Black was the last publisher I met that day. Did you do other types of illustrating before you got that book contract? Music was (and still is) one of my other big loves. Although Fatbag was my first illustration commission, straight after graduation I used to run a post-punk music and arts magazine called The Blue Blanket – it was my own enterprise so hardly a ‘commission’ – I was editor, chief writer and distributor, and of course drew all the illustrations. The first issue was made on a shoestring budget but sold out, altogether it ran for 6 issues, each more accomplished and better printed and bigger print run than the previous. By the last issue it was a full time job putting it together, but the commission for Fatbag persuaded me to concentrate on my illustration career, the magazine folded soon after I left and moved to London. How many picture books have your illustrated? Including UK, US and Japanese titles, children’s books altogether is over 50 now I believe – of those, 20 are trade picture books of one form or another, another half-dozen non-trade picture books (mass market etc) and the remainder illustrated novels with B/W drawings and coloured cover etc. I should clarify that in general my Japanese language books are not distributed in the US or UK, and vice versa, though some of my US books are now being translated into Japanese. I love the illustrations in your new book Crinkle, Crackle, CRACK – It’s Spring! How did that contract find it’s way to you? I first met editors from Holiday House at the Bologna Book Fair in Italy, from which they commissioned my previous book with Marion Dane Bauer – Halloween Forest (Holiday House, 2012). I was due to illustrate another Halloween title for HH, but that manuscript needed some revision so in the meantime they asked Marion if she had a Spring themed title – this book was the result! Naturally I was delighted to work on another of Marion’s titles, I find her style of writing particularly inspiring. Was that your first US published book? No, my first book in the US was my very first trade picture book The Secret in the Matchbox (written by Val Willis) – it was a co-edition between Farrar, Straus and Giroux and Andre Deutsch in London, published in 1988, I believe it received a Parent’s Choice Award in the US. For that book all my dealings were with my London publisher, I wasn’t in direct contact with the US publisher and didn’t know the US editor, however much later I discovered it was Stephen Roxburgh. He later commissioned me for MVP (2003, novel by Douglas Evans) and The Boat in the Tree (2007, picture book by Tim Wynn Jones) when he ran Front Street Books, they were my first books directly commissioned from a US publisher for the US market, as opposed to a co-edition. Well, there’s financial success and there’s creative success, unfortunately they don’t always meet in the same titles! The books I’ve illustrated over the last few years are all things I’m especially proud of. Once a book is completed though I tend to think more about the next one, it can be off putting to think too much about your previous output, my best work is yet to come. Yes, 100% illustration, although I volunteer for SCBWI still when I can, which involves editorial and organising skills. I’ve had other experiences in the past when I lived in Japan. My late wife worked in the fashion industry and I was a professional model for some years, appearing on a lot of catwalks, TV and so on – most definitely retired now though! Apart from illustration, music and history are my chief interests these days, though illustration remains my sole paying career. I’ve illustrated several of my own texts published in Japanese – e.g. the picture book Hoppy no Atarashii Uchi and my retelling of Jack & the Beanstalk (both published by Fukuinkan Shoten in Japan), but so far I’ve no stories published in English. I’ve occasionally submitted my story ideas to publishers in the West, my agent is always seeking more from me on this front, recently I’ve been very busy with illustration commissions though, I keep story notes, but haven’t polished them up to a degree I’m happy to submit for a while. This is definitely an area I want to work on though! 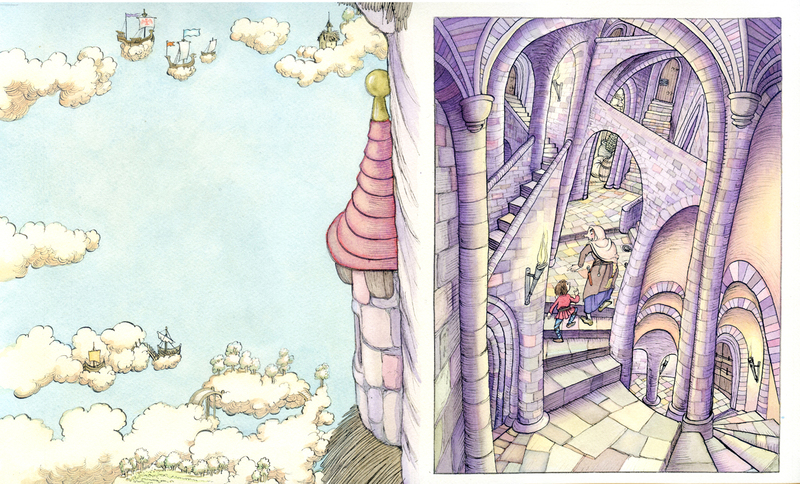 Have you ever thought about trying to do a wordless picture book? Yes, I did one a long time ago in Japan, I’d very much like to do another. Do you have an artist rep.? If so, How and when did the two of you connect? How long have you been working together? My agent in the US is Laura Rennert at the Andrea Brown Literary Agency, I’ve been with her for over 10 years now. Laura used to live in Japan many years ago so we have something in common, though we didn’t meet at that time. I don’t currently have an agent in the UK, nor an agent in Japan, just long-time friends who help with my affairs there when required. Japan is a little different from the West, children’s book agents are not common. Absolutely – pen and ink! I like traditional materials, but especially the appeal of black line on white paper. For sketching I use Pilot Hi-Tec pens, but for illustration artwork a pen holder, traditional drawing nib and india ink has always been the cornerstone of my work. For colour I’m pretty obsessed with watercolour too, though it’s a love-hate relationship. Occasionally, for non-fiction work usually. Mobile phones are great tools for snapping poses – my forthcoming book has a self-portrait and several hands referenced from snapshots. Mostly though if I use references it’s from books or the web. Most of my non-children’s book work (advertising/editorial) is coloured digitally, but nowadays with Clip Studio, not Photoshop, I gave up on Adobe some time ago when I upgraded my Mac. For many years in Japan my chief income was from advertising, my children’s books were an ‘antidote’ to the hard-edged graphic poster work, thus I’ve always prefered to create books as much as possible using traditional materials. For me, posters are there to reach out and grab the viewer, so computer graphics and digital art is perfect. However children’s books are more about inticing the viewer into a secret world, they draw the viewer into a personal environment, and for that I always prefer the tactile sense of traditional hand-made techniques. Yes, I’ve a Wacom Intuos 3, used for editorial and non-children’s work mostly. Starting to show it’s age now! Do you do exhibits to market your art? I go back to Japan most summers and exhibit in Tokyo bi-annually usually. In the UK I’ve a current long-running exhibition at Norwich hospital, but no other shows planned. I don’t usually sell the originals to my picture books, so sales come from work created especially for the show, or prints. In the 80’s before I moved to Tokyo I worked a lot for magazines in London. In Japan I worked on magazines sporadically over the years. Since 2010 I draw a regular monthly cut for ANA Airline’s inflight magazine Wingspan. I’ve not worked on any US magazines at all, though would be interested in that route! Yes, I’ve a ground floor room in my house used as my studio – I think it was designed to be used as a dining room, but I bought the property precisely because the layout gave me this room separate from the ‘domestic’ side of the house which I could use as a work room. Formerly when I was in Japan I always had a separate rented studio space, but now as a widower raising my daughter alone, working at home in the UK gives me the most flexibility. The only problem is that I don’t get enough exercise! I need music/discussion while I work, so I always have the BBC iplayer up and running on my Mac, invariably tuned into Radio 4 or BBC 6 music. Due for publication in March 2016, it’s a non-fiction work describing London and The Globe theatre in Shakespeare’s time, and shows how words we use in everyday speech today originally derived from Will’s plays. I’m really excited about this book’s release. I’m a history nut anyway, so it was an absolutely fascinating project to work on, the research combined with the artwork consumed almost a year, historical non-fiction is a lot of work! Certainly social media has had an impact on the way we connect to our audience and (particularly) our peers. The internet is a tremendous tool for research of course, the best thing from a practical point of view for me is Google image search. As for opening doors though I’m not so sure – social media is great, but for me the personal connection, meeting people face-to-face, has always had more resonance than the internet. To survive financially and make fine books that stay in print for a long time. Currently I’m working on a picture book for Fukuinkan Shoten in Japan, set in Tokyo, about a child’s fascination for the stars and journey with their family to the country to find dark skies. It’s a fictional story threaded into a non-fiction book about star gazing. The cornerstones of any successful children’s illustration are composition, lighting, character and texture. Good illustrations have one of more of these clearly defined – If something isn’t working in an illustration think of these things – can the lighting be made more dramatic? Can the composition be more dynamic? Can the characters be better crafted? Can the texture or treatment give more power to the image? Often it’s good to put something away and come back to it the next day with these things in mind. It’s a tough business these days, but the trick is to persevere and always try to develop what you do, being dissatisfied with your work is a good sign – it encourages you to take things to the next level. Fine tune your work, listen to advice, if something isn’t working then be flexible enough to start again in a new direction, but don’t lose track of the core things that really inspire you. If there’s something you find a real struggle, then concentrate on those things you find more at ease with, become a master of the things you’re good at, and the other things will naturally become less challenging as time goes on. Creativity is a lot like flowing water – it will always take the least path of resistance. If it flows, go with it! If you have a minute, please leave a comment for John. I am sure he’d love it and I enjoy reading them, too. Thanks! Thanks a lot!! I’ve always learnt with your entrace and this one I’ve really liked it. Thank you very much. John Shelley’s work is magical! Really delightful! Enjoyed this post and John’s work a great deal. Thanks! John’s work is exquisite. Am especially enamored of his bear and I can’t wait to see Will’s Words. Have always adored pen and ink work. Thanks so much. Gorgeous work. I loved learning about John’s process. Thank you for sharing. A totally illuminating interview with an amazing illustrator. Thank you so much for sharing so many of your wonderful illustrations along with your responses. I only wished they were larger on my screen as they have so much fine detail within them. Thanks for sharing — very informative! 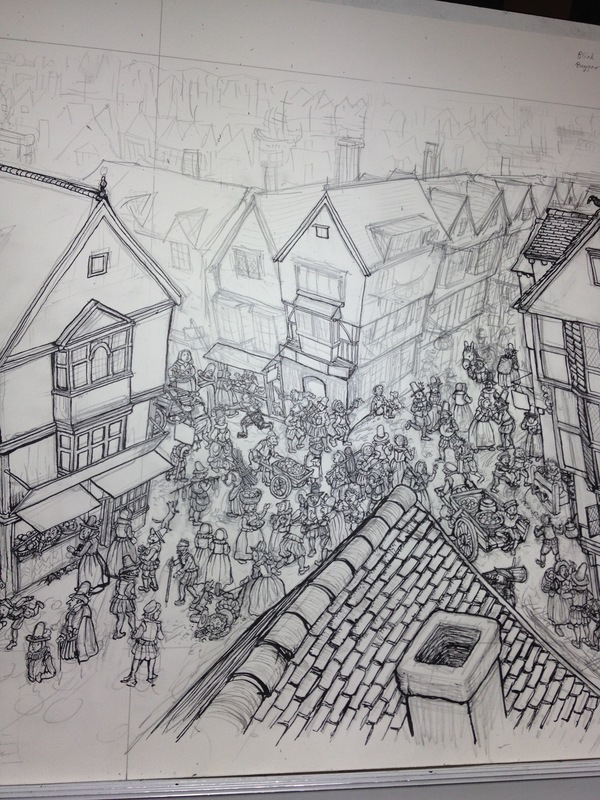 It was so interesting to discover the processes behind your skilled illustrations, John. I especially adore your lovely skies, trees and animals (wonderful bear!). I loved this post! Such detailed work. I looked at every picture more than once especially “Will’s Words” and the Halloween trees. Beautiful! I’m always blown away by your work, John. Absolutely beautiful. You are an inspiration!! 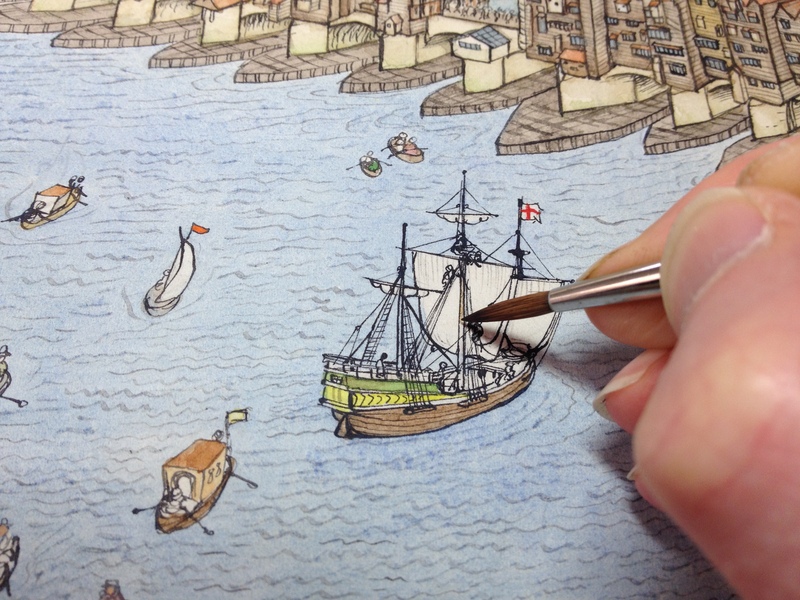 What an excellent feature and a fantastic insight into one of today’s most talented water colour book illustrators. Thanks for being so generous with the illustration examples. What a fascinating interview – I love John’s illustration and it’s so interesting to follow the process of how he works. So many lovely comments! Thank you everyone!! “…being dissatisfied with your work is a good sign – it encourages you to take things to the next level.” I needed to be reminded that this morning. So, onto the next level!- Thanks John!